As a gym janitor, it's your job to sweep and mop the gym floors before and after each busy period at your local gym. Be sure to keep up you're cleaning skills to receive a promotion. You are coaching all sorts of sports at the local community center. Be sure to keep up your body skills and your fitness enthusiasm to succeed in this career! You are the assistant to the fitness trainer. It's your job to spot the person working out, and bring them water, fitness drinks, and fresh towels, while the trainer gives them advice on how to buff up. The life of a Fitness Trainer involves working one on one with the customers who come in the gym, to help keep them lean and buff. Increase your fitness enthusiasm, and drink plenty of instant meals and fitness drinks to keep yourself physically fit. As a gym manger, it's your job to focus on running a successful gym. You are in charge of all the employees of the gym. You will also be giving private workout sessions to those who have enough simoleons. 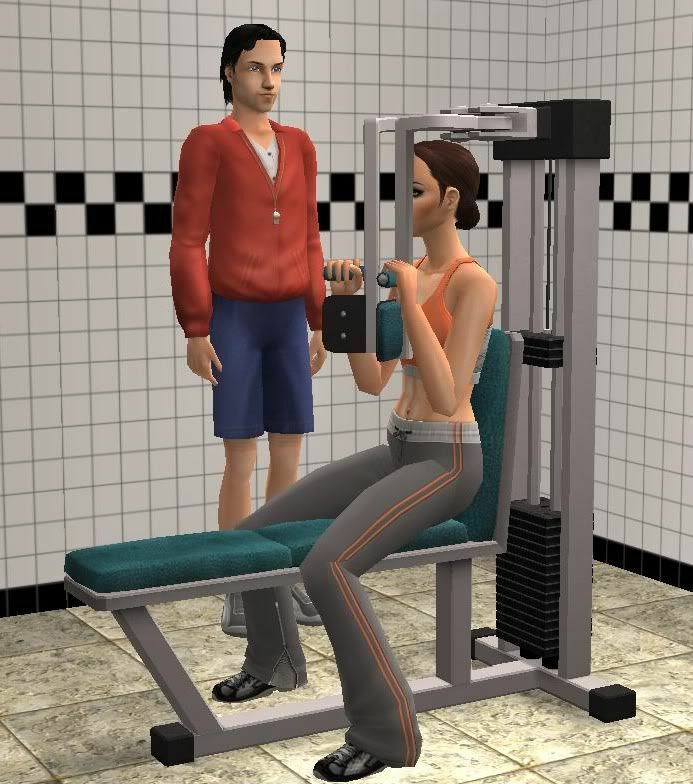 A Fitness Video Trainer's job is to go on camera and show sims at home how to workout properly. Be sure you workout on the treadmill at home so that you can look good on camera. No one wants to see a flabby workout trainer trying to tell them how to look good! You are Local Television Gym Show Host. You will be appearing on Fit Intensity on the television station run by your neighborhood. You will be showing people some of your favorite workout routines, as well as taking calls, and answering questions having to do with fitness. You are in the limelight! All the fitness enthusiasts in Sim City watch your show Getting Lean. You've gained quite a status in the fitness community as well. Soon you will be at the top of your game! It's your job to be the personal trainer to the stars! You are living up. Fancy cars, nice houses, schmoozing with stars. You really do have the perfect body, and the stars of Sim City want to look just like you! You've reached the top of your career. You hold the title as Mr. Universe, you have several celebrity clients, and you appear regularly on talk shows and infomercials. You've reached the top of your career. You hold the title as Mrs. Universe, you have several celebrity clients, and you appear regularly on talk shows and infomercials. Hey Jon, I just started using this career although I've had for 2 years. Well my Sim is now a millionaire - one of the chance cards was supposed to give a 10,000 bonus and instead gave my Sim 10 million dollars - good thing he is a fortune Sim. I just thought you might want to know.